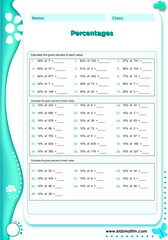 Math worksheets on ratio and percentages for children from 4th to 7th grades. Topics include converting fractions to ratios and percentages, finding the percentage of numbers, percentages in word problems related to math, and more. These worksheets can be used as maths tests on ratios and percentages. Get more practice by printing these worksheets for classroom and homeschool use. Practice Convert ratios to percents fractions with this worksheet. 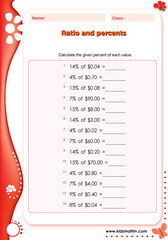 Practice Percentage of money with this worksheet. 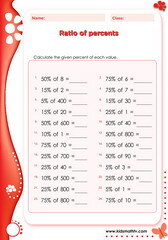 Practice Percentage of numbers with this worksheet. Practice Percentage of numbers round figures with this worksheet. 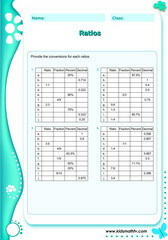 Practice Percents of numbers with this worksheet. Practice Ratio percent decimals fractions convertions with this worksheet. Practice Ratios with this worksheet. Practice Percents and ratios with this worksheet.